The Mystic Lakes are a popular stop along the Scenic Byways ride. Medford is a great place for bike riding! Whether you do it for fitness, to have fun with your kids or simply to get to the places you need to go—there’s a ride for you. We asked Medford bike riders on our Facebook page about their favorite places to ride in the city and got some great ideas. Here are five routes that we think you might like to try—and to make them even better—local cyclist Kasia Sierzputowska has added Ride With GPS maps. Thanks Kasia! This ride takes you past some of Medford’s greatest natural and historic attractions. Highlights include the Mystic Lakes and the Shepherd Brooks Estate. If you are lucky, you might even spot a bald eagle along the route. Gentle inclines, wide shoulders on Mystic Valley Parkway and some rustic riding through the Brooks Estate. On a first date and want everything to go just right? Take this casual ride at sunset and stop off along the way to enjoy views of the Boston skyline, boats on the river and numerous water birds, including swans. There are lots of dining options—from a just-getting-to-know-you coffee or ice cream, to a more serious full-course dinner—at Assembly Row. Somerville riders, the path goes both ways! It ends just a few blocks from Medford Square where you can enjoy the romantic setting of the oyster bar at Carroll’s which overlooks the Mystic River, stop for coffee at Mystic Coffee Roaster or check out the Circle the Square street festival on the third Thursdays in June, July and August. Plenty of free parking at Riverbend Park and riding on paths all the way to the network of marked bike lanes at Assembly Row. Cross the Mystic River at Rt. 16 by using the sidewalk and look for the underpasses below Rts. 16 and 28. 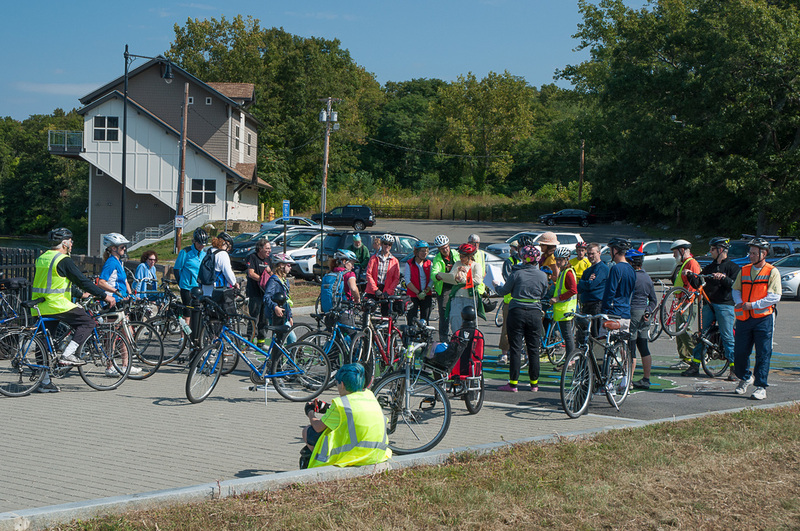 This loop is short for a full workout, but is a good introduction to the open-road riding opportunities in and around the Middlesex Fells, which are also popular for mountain-biking. Start at Victory Park and ride it in a clockwise direction to minimize left turns that may require you to stop for oncoming traffic. A path that’s great for younger riders. The slight up-hill should not be a discouragement when the objective is such an exciting destination, but it is easy to turn back if it proves too far. Park at the Flynn Rink. If riding with very little ones be mindful that the path is separated from Woodland Road by only the curb in some places. What’s the quickest, easiest way to get from Medford Square to Davis Square? By bike, of course! Easy access to the Red Line and major bike routes into Boston make these streets some of the most used by Medford bike commuters. Because of the many one-way streets, it’s mapped to ride in a counter-clockwise direction. You will likely use it for shopping or running errands and will want to modify it to suit your own needs.